At 1pm on 11 November, Remembrance Sunday and 50th anniversary of the Armistice after the First World War, take steps in developing peaceful relations by walking around the War Memorial Park and talking with people from a different culture, race, religion, nation or age from you. Meet near the bus shelter in Coventry Park and Ride. Look for the UN flag. This is also the main car park in the Memorial Park. The entrance is at 36 Kenilworth Road, Coventry CV3 6PG. Buses 12X, 18A, 40, 45, 87, 89, U17 and X17 either stop here or nearby. This peaceful walk around the park will visit peace-related sites such as the Hiroshima Tree, the German Peace Garden and the War Memorial. It will end at the Visitors Center cafe not far from where it started. Event organised jointly by United Nations Association Coventry Branch and Coventry Lord Mayor’s Committee for Peace and Reconciliation. 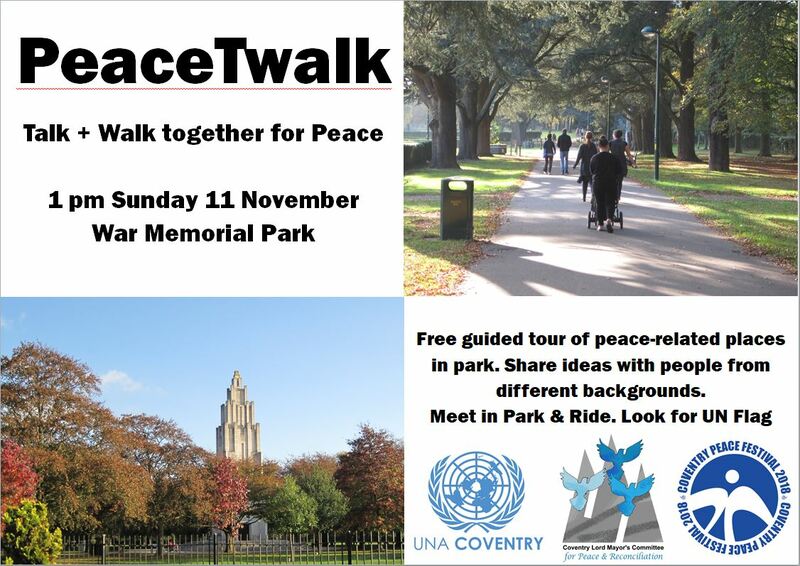 Download the guide to places of interest in the Memorial Park PeaceTwalk Info A4. Guides will receive a printed booklet containing this information on the day of the event.